Wisconsin is in serious trouble. Their budget is bleeding and they need to stop the wound. So newly-elected governor Scott Walker has proposed to slash state spending in drastic ways, and the state legislature is fast-tracking the budget proposal for a vote this week. Tomorrow, in fact. If that budget passes, Wisconsin will not merely be in trouble; Wisconsin will be doomed. The budget proposes to cut state spending on higher education as well as health services; will actively reduce the take-home pay of state employees, in part by requiring state employees to pay more out-of-pocket to their health benefits, and this includes teachers at all levels; and — most dangerously — will eliminate state employees’ right to collectively bargain, effectively destroying any chance they might have of ever regaining their current (already minuscule) pay and benefits. Such a wound to state employees’ pay and benefits will have a ripple effect not just across the state in real time, this year, but also across time, negatively impacting health, education, and workers rights for decades to come. This, in turn, can only dig a deeper hole in Wisconsin’s economy, not improve it. And Wisconsin is not alone. My mother, who is a school teacher in Texas, has reported dangerous slashes in Texas educational funding, including a virtual elimination of teachers’ retirement benefits. (There’s a demonstration planned at the Texas state capitol in March, if you’re interested.) A friend of mine teaching college in Georgia reported terrifying budget cuts in that state’s education funding last year. In fact, the Center on Budget and Policy Priorities reports that 46 states are proposing drastic budget cuts, which in our economy is not only understandable but necessary; but of those 46, 44 states are proposing cuts to funding for education. Which is unconscionable. 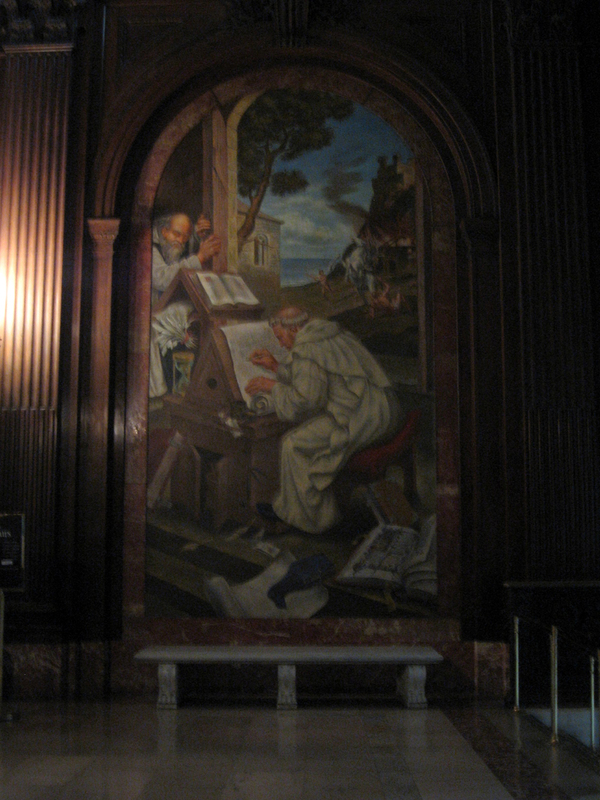 Scholar/monk in a scriptorium. Mural in the 5th Ave. branch of the NY Public Library, 31 January 2008. I’ve long revered the connection between higher education and monastic orders. In the West, this tradition dates most obviously to the late middle ages, which is why our “cap and gown” regalia so closely resemble clerical vestments (the “hood” of masters and doctoral degrees derives from the hoods that monks wear). In my beloved Buddhist tradition, this connection also exists, most evident in the formal courses of study and degrees offered within the various schools of Tibetan Buddhism (His Holiness the 14th Dalai Lama, for instance, holds a “geshe” degree, which is the equivalent of a PhD in Buddhism, complete with area specializations and grueling oral exams). I’ve always viewed academia as a vocation rather than as a mere job; it’s something we do not for the money but despite the money. And for that reason, I view my entering into this notoriously underpaid and undervalued profession as a kind of de facto vow of poverty. But more recently, I’ve been thinking about this issue from another perspective. In Buddhism, as in monastic Christianity, there has long been an understanding that the laity will support their teacher monks and nuns financially, on the understanding that the work these monastic scholars do directly benefits each of us through access to education and indirectly benefits all of society by advancing the course of human knowledge. It doesn’t always work out this way, of course — look at all the Christian monasteries who have had to turn to wine production, for just one example, in order to supplement their income from donations. And when you see yet another book on the shelf from some Buddhist teacher or another and you wonder how many times these revered gurus can say some variation of the same thing, understand that they publish so many books partly because their monasteries, schools, and libraries need the funding. And when you see your child’s teacher behind the cash register at Wal-Mart on the weekends, or your college professor turns up at your door to deliver your pizza, understand that they’re there because they need the money we as a society haven’t been willing to give them. If you have kids, ask yourself what your child’s education is worth. What is your child’s future worth, in dollars? When your child’s teachers send home notes asking for your help providing resources for the classroom — writing utensils, paper, books, glue — you will probably ask yourself, Don’t they have this stuff in school? Why do I have to provide everything? 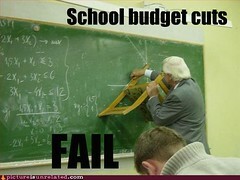 The answers are these: No, they do not have this stuff in school, because the school’s budgets are too low. And you would be providing these things one way or another, either through taxes or through your own shopping trips or through fund-raisers hosted by the students themselves, but if you provided them through taxes and the schools are able to use their educator discounts and bulk-order discounts and buy everything up front with your tax dollars, you would wind up spending a lot less out of pocket for those supplies, and our students will all have a lot more of the materials and opportunities they need. If you have a kid in college, or if you are a college student yourself, consider this: Classes are getting larger, curriculum is getting less rigorous, and consequently students are learning less, but this is not because the teachers lack academic rigor. Not at all. It’s because the universities are losing billions in state and federal funding, and in order to make up for those shortcomings they are hiring fewer full-time faculty and more part-time and adjunct faculty. These part-timers and adjuncts are the same people we would have as full-time professors — with the same qualifications, the same academic rigor, the same devotion to their given disciplines — as any tenure-track faculty member, but because they have to work part-time, in larger classrooms, with fewer resources, they find themselves stretched so thin they have no choice but to give less to each student. Take away their benefits like health insurance or retirement income, and they wind up having to teach more classes, often on several campuses, stretching their time and energy even thinner, giving even less to each student. In this environment, faculty salaries start becoming devalued, dropping to meet the lower salaries of adjuncts rather than adjunct salaries rising to reflect the value they provide a university; faculty then spend more time fighting for their very livelihoods and less time on scholarship and teaching. Meanwhile, the universities also have to cut back on how often they update textbooks, how regularly they upgrade classroom technology and how well they maintain that classroom technology, and the caliber and frequency of visiting scholars and artists that can enhance a student’s academic experience. All of this results from poor funding. And we control that funding. We have the ability to demand that our government better funds our schools and colleges and universities; we have the ability to demand that our government better supports our teachers. And when our politicians wonder where that money is going to come from, we have the opportunity to volunteer it. That money will come from us, and we should be happy to pay it. I urge you to get online and find the website for your state government. If you need help, try the resources at the League of Women Voters, who keep tabs on your government for you. Look up your state’s budget and find out how much your state is giving to education. I will guarantee you it’s not enough. So while you’re there, find your state representatives and contact them to demand increased spending on education. And if you live in a state that is considering cutting education funding (and with 46 states lined up for just such a cut, chances are you do), contact your representatives and demand they vote against those cuts! And in case you think this is just about the teachers, consider this: on Monday, students across Wisconsin staged `60-era-style mass walkouts in schools, colleges, and universities as a sign of their support for their teachers. They marched down to the Wisconsin state capitol and demonstrated inside and out, demanding that their legislators “kill this bill.” Because if Walker’s budget passes, teachers will be so severely damaged financially that many will have no choice but to leave the profession or leave the state; and without those teachers, these students said, the students’ education and their futures will be doomed. This isn’t about my friends’ salaries. This is about the future of education. This is about you. Hi! I’ve been following your web site for a while now and finally got the courage to go ahead and give you a shout out from Huffman Tx! Just wanted to tell you keep up the fantastic job!